Here it is, week 24 of the Bloggers Challenge! This weeks challenge was to use watercolor crayons on your card or project. There's so many great ways to use watercolor crayons, I could have made a ton of samples to share with you. When you open this up, you'll see the gift card on the inside. I made these to fit inside the Gift Card Envelopes. My next sample uses the Technicolor Watercolor Technique from the 12/07 TJNL. I just love the Fern Leaf Tooled Leather Background stamp from Starving Artistamps. I stamped the background image on my confetti with Night of Navy and sponged around the edges with my navy ink. I used shades of blue watercolor crayons to create my Technicolor Watercolor, and stamped my background with Navy ink, again I sponged around the edge. 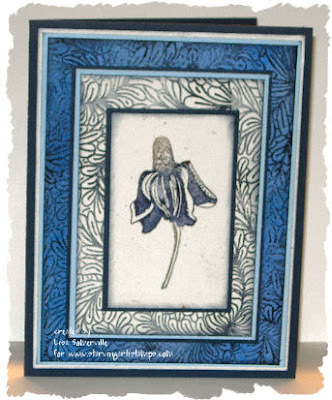 The flower image is also from Artful Inkables . I colored the flower image with markers, stamped on my confetti and sponged the edges with Navy ink. Really lovely cards!! Great colors for winter. So Pretty Lisa...............The Red one is cute as a button. I love the colours in the blue and the elegance of your cards!! Wonderful cards, Lisa...as always. Great colors. I especially love the blue one! Great cards, Lisa! I love both of them...especially the first one--I've never done that technique with crayons, so will have to check out my past issues of TJ! These are nice Lisa. 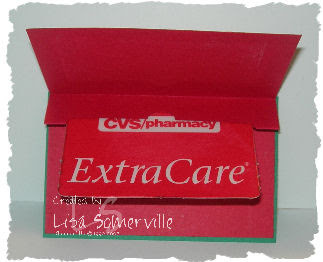 I like the red one...great idea for a gift card holder. They both look great! I so love doing gift card holders! Love both cards Lisa! The gift card holder is super cool! I might need to resubscribe to the TJNL to learn how to do the Embossed Watercolor Crayon Technique. Beautiful job! 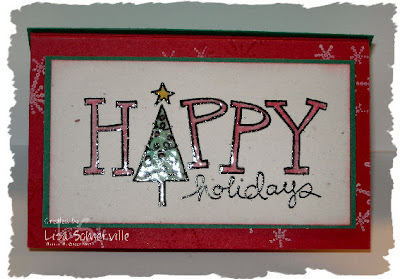 I love the shiny look from the embossed watercolor crayon technique on the gift card holder. I like the shiny look of the letters on your first card. However that blue flower card really is striking. Gorgeous work!! and what great stamps and color choices. Lisa these are both great. I especially love the first one. I love that technique. great cards Lisa!! love how the letters shine!! Great cards Lisa! You always amaze me with your creativity! Both are great cards. I need to try out the Technicolor Watercolor Technique next! Both cards are hot to trot, Lisa!! !